The World Peace Prayer Society is a non-denominational spiritual movement that traces its roots back to the contemplative thoughts of Masahisa Goi, a Japanese writer greatly inspired by the devastation of World II – especially the mass destruction resulting from the atomic bombs dropped over Hiroshima and Nagasaki. Born on November 22, 1916 in Tokyo, Japan, Goi dedicated a great deal of thought and meditation to world violence, war and other destructive aspects of humanity – as well as the related need for international peace and harmony. His devotion to prayer and spirituality led to an understanding that energy emanates from the words, thoughts and intentions of all human beings – and by speaking, acting and living in the essence of prayer, they can foster peace on earth. The result of his thinking and writing has been an earnest worldwide peace movement referred to as May Peace Prevail on Earth. The first steps in fostering the worldwide appeal of Goi’s movement occurred in Ishikawa, Japan, when he began to hold neighborhood gatherings in 1955. Gradually, the appeal of these meetings grew more popular in his native country, which had a very keen interest in the promotion of world peace due to the destructive aftermath of 2 atomic bombs. Stickers and advertisements appeared in stores, promoters handed out literature in various public locations such as train stations, and the use of “peace poles” grew more popular. By 1983, the use of these poles as a medium of expression had taken on international implications – and the planting of these poles throughout the world is known as the Peace Pole Project. 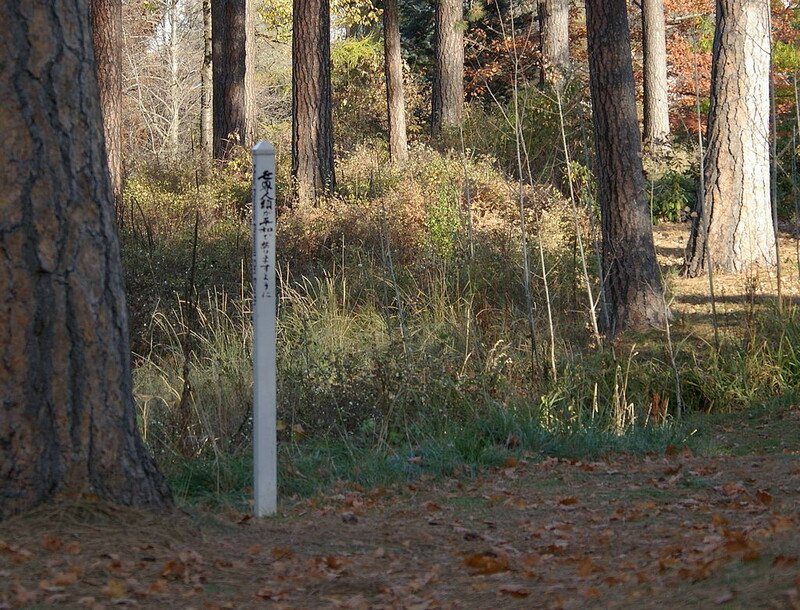 A peace pole is a monument conveying the message “May Peace Prevail on Earth,” inscribed in the language of the nation where it has been erected – and in 3 or 4 other translations as well. Made from a variety of materials such as granite or wood, the size of these poles can range from very large to small. The text of the message might be carved, engraved or painted – and in some cases it is a longish plastic or metal sign attached to the pole with screws. The custom of planting peace poles has spread throughout the world, even to the point of including “peace pole makers” where a variety of poles can be purchased. Since 1983, it is estimated that over 100,000 peace poles have been placed in 190 countries throughout the world – with the largest perhaps being the 52 foot giant erected in Janesville, Wisconsin as a protest to the KKK. Proponents of the movement are proud to mention that a peace pole has even been placed at the North Pole, and many prominent celebrities, such as Pope John Paul II, have been photographed standing next to one. 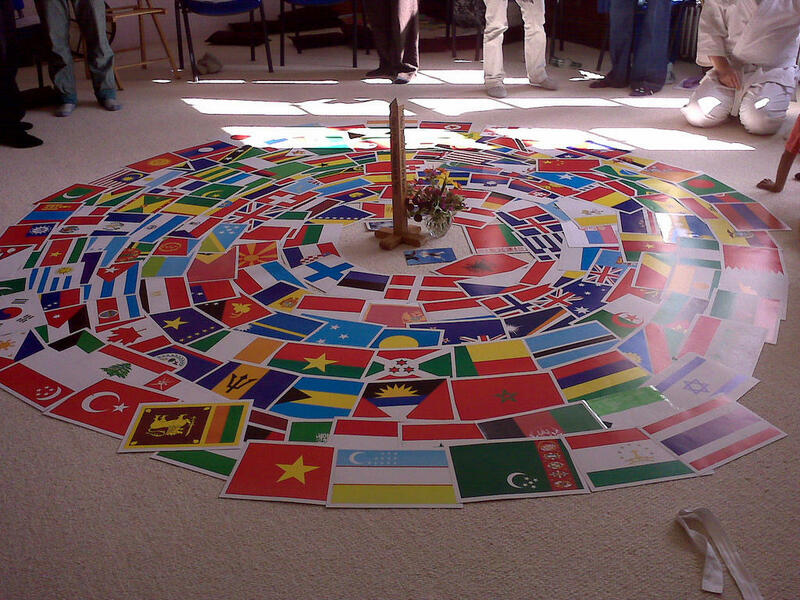 The World Peace Prayer and Flag Ceremony has occurred in every continent and major city of the world. Sometimes labeled as a “non-sectarian pacifist organization,” the World Peace Prayer Society (WPPS) has grown even more rapidly in the wake of Mr. Goi’s death in 1983 – at which time leadership of the crusade fell to his adopted daughter, Masami Saionji, who is a descendant of the Royal Rykyu Family of Okinawa. Under her guidance, the society has achieved international notoriety through efforts such as the World Peace Prayer and Flag Ceremony, a global celebration of human compassion and togetherness that has occurred in every continent and major city of the world. In 1990, the World Peace Prayer Society was officially recognized by the United Nations as a Non-Governmental Organization (NGO), affiliated in such respects through the United Nations Department of Public Information. The function of WPPS within the United Nations is to provide “neutral prayer” that “can serve as a spiritual bridge, even in a secular setting, among people from all parts of the world.” This effort has proven very effective throughout many facets of the UN, including “governments, agencies, departments, NGOs and events.” An official sticker supporting the efforts of the United Nations through the advancement of the “prayer for world peace” received approval for worldwide distribution as part of the UN’s 50th anniversary in 1995. WPPS actively sponsors a World Peace Prayer Ceremony that has been held in the General Assembly Hall of the United Nations, sometimes involving more than 2,000 people in an observance at which each member country is called by name, allowed to raise its national flag, and offered a prayer for peace. A peace pole once adorned the lobby of the United Nations for a period of 18 months during the years of 2004 and 2005, when visitors “wrote prayers for peace and placed them inside the pole.” A permanent peace pole is located outside the New York home for the United Nations Environment Program. We live in an age where images of negative events are telecast daily throughout the world, many times involving hatred, violence, war, and the tragic loss of human lives. Perhaps the most frightening and threatening of these incidents involve acts of radical violence, performed by transnational groups that are intent on promoting a culture of hatred and destruction. In many respects, the greatest impediment to promoting a culture of peace in the world is the overall image such terrorist acts often bring to the forefront of society. Too often the “war on terror” and a constant emphasis on “security” overshadow the need for promoting a culture of peace, which is the primary mission of the World Peace Prayer Society and the Peace Pole Project. The advocates of this website urge you to plant your own peace pole and stand up against the culture of death encouraged by worldwide terrorist organizations. You can also make a significant impact on world peace by clicking on the link below and signing the petition this website sponsors. This entry was posted in Posts for the Cause and tagged Activism and Peace Work, Architecture, monuments to victims of terrorism, peace, Pope John Paul II, terrorism, United Nations, world brotherhood, World peace, World Peace Prayer Society. Bookmark the permalink. This is a great post about how the world is reaching out for peace and recognition.